Whether it’s your first Montreal visit or your twentieth, trying a restaurant for the first time is always a bit risky, especially if it’s new. That’s why we’ve pre-screened the new kids on the block for you, selecting only the best new eateries in the city. In no particular order, here is a list of amazing new places treating Montreal with culinary delights. They’ve recently opened-up or have been perfecting their technique for just a couple years, but are definitely turning heads with their culinary finesse. Everything you could possibly crave is in this list: from tacos to noodles, from fine French cuisine to delicious vegan options, and from Haitian fares to Spanish tapas. If you’re ever trying to decide where to spend a great evening in the company of delicious food, this list can help you make the best decision. Take a look below for some hints on where to eat, where to drink, and even some suggestions on what to do while you’re in the area. If the whole city is too much to choose from, try picking a spot from our list of 17+ Delicious Old Montreal Restaurants You Must Try or discover something new from these 13 Delicious Mile End Montreal Restaurants You Can’t Miss. In the heart of scenic Old Montreal, sits a stylish new Italian « caffe » that combines timeless Parisian elegance with today’s sensibilities. Un Po’ Di Più is the brand-new venture by the culinary genius behind Foxy and Olive & Gourmando, which have truly become mainstays of the Montreal food scene. Upscale without being stuffy, it’s easy to see how this new enterprise is ready to become a heavyweight in its own right. From morning to night, they serve colourful and imaginative plates, cocktails, and, of course, coffee. Stop by to slow down. 3 Rue de la Commune E.
Clairon is a bright new Plateau spot with a local farm-to-table approach that gives the bustling area a taste of place. The ingredients all come from nearby and work together to create dishes that are a beautiful blend of various textures, colours and flavours. Run by restauranteurs that are still in their late 20s, Clairon really has a fresh vision for what dining can be. The restaurant fuses the energy of the surrounding cityscape with a refined culinary outlook that always seemed to be reserved for older generations. Mon Lapin is a much anticipated new wine bar in Little Italy. Opened by the team behind Joe Beef – a famed Montreal establishment – the cozy corner spot doesn’t have any of the ego that can come with a star studded team. It seats only 35 customers at a time and serves 15 constantly rotating dishes made of local farm fresh ingredients that strive to please the mouth instead of the eyes. Most importantly, it features a tasteful selection of natural wines, which take centre stage in the middle of the room. Mon Lapin doesn’t take reservations, so stop by soon to see what the buzz is about! Hanzo is also brought to you several big names in the restaurant game, coming from projects in Montreal, Toronto and Quebec City. Together, it’s a winning recipe and this new venture is definitely living up to expectations. Inside, you’ll find the decor is playfully inspired by the Crazy 88 scene in Kill Bill, an influence that also makes its way onto the menu. Despite the fun of the setting, they’re serving some seriously good Japanese food. The easily shareable izakaya dishes are innovative and packed with flavour, and the cocktails are sure to hit the right note. Stepping into Hanzo off the Old Montreal streets is like being transported into a cinematic dreamscape that will definitley leave you satisfied, for real. Former sous-chef at world-renowned restaurant Toqué is back with this new co-venture. Moccione is, by comparison, a simpler place and focuses instead on creating a warm atmosphere that makes visitors feel right at home. They serve simple Italian dishes with authentic ingredients alongside a comprehensive wine list, each the product of many years of experience and expertise. Moccione is upscale without being over-the-top, fitting perfectly into its cozy Villeray location. The restaurant only opened recently, but definitley got it right. Its simple elegance and effortless atmosphere (that can only be the product of a lot of thought) leaves diners excited to come back for more. 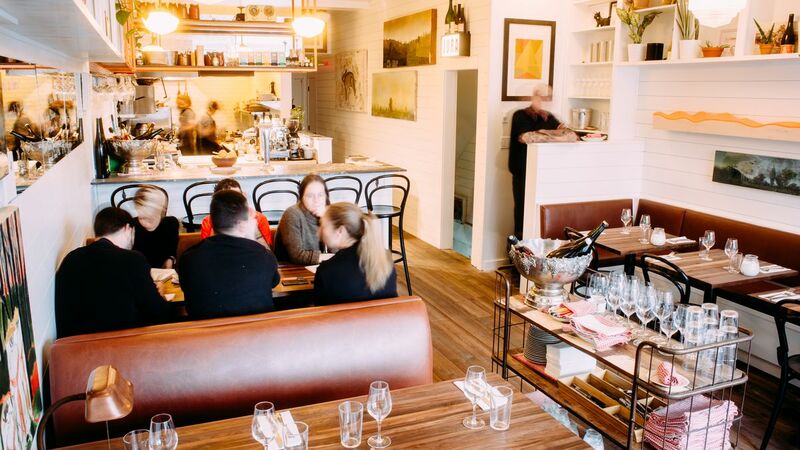 Located between Griffintown and Old Montreal, Mélisse serves up simple goodness day round. With its roots in brunch, the restaurant is now open for dinner too. At Mélisse, you can count on food that is light, fresh and thought out, just like the airy decor. Whether you’re having a cup of coffee or a glass of wine, sitting inside or on the spacious terrace – stop by soon. 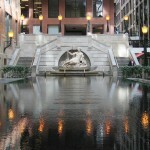 The restaurant is a peaceful oasis that serves fresh local food and a moment of rest in the heart of Montreal. Moleskine is never really one thing. With an upper level dedicated to refined Italian dining, and a lower level that serves wood-oven pizza (for here or to go), as well as ice-cream, Moleskine is a restaurant with a split personality that offers something for everyone. Both upstairs and down you’ll find innovation that packs a punch: hearty and memorable dishes above, simple and well-made bites below. Its name, even, is a nod to Nota Bene, a charming stationary store next door. Nominated by EnRoute for its list of best Canadian restaurants in 2017, Moleskine is worth paying a visit – or two. Another wine bar member of the Joe Beef family, Le Vin Papillon is currently ranked at number 5 in Canada’s 100 Best Restaurants. Not quite as new as Mon Lapin, but just as witty and fresh, it specializes in vegetable dishes, however, sometimes cooked in butter or duck fat, they are not quite vegetarian. Their decadent ham is also turning heads. Paired with the roasted caramel flavours of their innovative comfort foods is a wide selection natural wines – all in a cozy Little Burgundy location. In the summer, you can hope to get a seat on the amazing patio, but come early as they do not take reservations. Mae Sri is a little Thaï noodle counter near McGill with understated modern decor. It’s the perfect place for a casual meal that still goes the extra mile. Their dishes are actually quite inexpensive, and that definitely does not mean sacrificing flavour. The menu features authentic dishes that pay tribute to their Thai homeland instead of sticking to menu items that are usually seen here in North America. They also have a selection of gluten free and vegetarian dishes, making the food accessible to even more people. Escondite is the city’s favourite funky Mexican restaurant. Not only is the food fun, if you’re looking for a little help in the conversation-starter department, Escondite is definitely your friend. Their décor consists of as many twists as their dishes: images of Mexican wrestlers and neon lights line the walls, and everything from pork and pineapple tacos to smoked meat poutine assemble on plates. Escondite translates to “hideout,” which makes sense because hiding out here is an experience you won’t want to miss. If you’re still unconvinced, that’s okay: they also offer signature drinks that you can enjoy on their terrace in the summer, making it one of the best places to eat in Montreal. The experience of dining at Le Mousso is unparalleled. Antonin Mousseau-Rivard comes from a long line of artists and formerly worked as the head chef at Contemporain, the Montreal Museum of Contemporary Art’s restaurant. Naturally, his food is infused with spirit of ingenuity and creativity. Each dish on the 13 course tasting menu at Le Musso is a crefully crafted work of culinary art. Presentented in handmade ceramic bowls and plates they are beautiful to the eyes, and on the palate, especially when expertly paired with the perfect wine. If you’d rather try the food through an à la carte experience, Le Petit Mousso next door provides the same attention to detail, and is open to walk-ins, too. In the heart of St-Henri, we begin with a bit of humour at this French-with-hints-of-American restaurant, Foiegwa. The name was inspired by how anglophones pronounce foie gras–without the ‘Rrr’–which is one of the many French words Americans and Canadians butcher. Speaking of butcher, Foiegwa serves-up a delectable selection of meat: dishes like their boeuf bourguignon, their poached black cod, and their locally-sourced, organic fried chicken. Foiegwa is a fine-dining experience without the pretentiousness: it’s located in a venue that formerly housed the Quebec fast-food joint, La Belle Province. Its decor is simple: white tiles line the walls and ceiling and dozens of sketches of famous Quebec figures are mounted on the walls. You’ll find American-style cocktails to pair with your meal here at Foie Gras–oops–Foiegwa. Up next from the fine dining circuit is Pastel. The dishes here are elegant, carefully crafted and inspiring. In fact – everything about the restaurant is. With the finest attention to detail, they manage to pull off a dining experience that is upscale and looks after your every need, yet carries the wamth of meeting old friends. Plus, the well-designed decor definitel lives up to the name. Their tasting menu comes with 9 courses and is crafted from local ingredients. For drink pairings they offer wine, naturally, as well as a non-alcoholic option that makes this the perfect place to celebrate a special occassion as a whole family, or simply have a superbly romantic meal. Experience vegetarian and vegan dining at its finest–LOV (Local, Organic, Vegetarian) is a fine dining experience without the meat. Located in Old Montreal, LOV is a bright, airy restaurant that feels like you’ve stepped into a botanical garden. The design is as cozy as it is sleek: wicker chairs hang from the ceiling and terrariums adorn each table. They only use the freshest ingredients in their dishes, which pair greatly with their beautifully-presented, zesty cocktails. They also offer a list of organic wine and beer. LOV is sure to please all customers with any diet, so bring your family, friends, date or anyone else you lov. Maneki Comptoir Asiat‘ makes its home in Montreal’s East end and is perfect for a sit-down mealor takeout. This casual comptoir serves up comfort food in the form of East Asian fares. That is to say, classic Asian via North America dishes like General Tao, pineapple chicken, and crispy sesame beef make their home on the menu. The space is modern and unique with zany posters plastered on the walls. The staff is always extremely friendly and the food is getting rave reviews; why not make this a stop for a hearty lunch? It might be clear by now that Old Montreal is really the epicentre of Montreal’s restaurant scene with impeccable food around every corner. Monarque is another new space that is no exception, finally landing in the area after years of anticipation. Well, technically – it’s a couple spaces – each with their own menu and ambiance. Monarque can be what you want it to be: a casual brasserie-style dinner for catching up with old friends, or an elegant fine dining experience that is sure to impress. Either way, the wine and beer lists are fantastic. True to its Saint Laurent location, Le Majestique is a bar, but one that does food exceptionally well. Amid the festivities of the boulevard, Majestique has managed to combine fine dining with a casual, exciting atmosphere, and an oyster bar. Their menu of small plates was created by Charles-Antoine Crète, the former chef at Toqué!, and stars a footlong hot dog. Both the meat and bun are made in house, and are topped off with a coleslaw made of red cabbage, apple and fried leek. Eat and be merry at Majestique, and try out their selection of cocktails, beers and affordable wines. Make your way to the heart of Chinatown for some exceptional Mexican food at La Capital Tacos! This family-run Taqueria serves authentic Mexican street food inside their cozy, unpretentious restaurant. The dishes are rich in flavour and never boring–their pork marinade is made with pineapple and orange mixed with a myriad of spices. The place usually fills up fast for lunch and dinner and is open until 2am on weekends. Stock-up on tacos, refried beans, homemade salsa and Mexican Jicama salad during your next visit to Chinatown! Located in Saint-Henri, Le Kioko is bringing Montreal’s sushi game up another level while still keeping it casual. Their focus is on sourcing fresh ingedients to make their poke bowls, salads and rolls some of the best Japanese food you can find in the city. With an aim like that, the flavours truly stand out. You can dine in at one of the few tables, or take it in your own direction, maybe enjoy your meal in the open air… That’s right, you won’t find another option for takeout or delivery that’s as fresh as this. Agrikol, a Haitian restaurant, is a young and trendy new hangout in the Gay Village, and it’s an exciting one for several reasons. First of all, it’s co-owned by Arcade Fire’s Régine Chassagne and Win Butler, as well as Jen Agg and artist Roland Jean, who both own restaurants in Toronto. All four owners traveled to Haiti, collecting artwork that you can now view on the restaurant walls. As a result, the dining room is beautifully decorated, reflecting a tropical, Caribbean vibe. Owner Jean can even be seen mixing live Haitian music most nights. Moreover, Talking Heads’ frontman, David Byrne, went there during his recent visit to Montreal! The star-studded restaurant doesn’t take reservations and there’s usually a lineup–but it’s worth the wait! Ibérica is a Spanish restaurant in the heart of downtown. After opening just last winter, it’s making a splash on the scene with its wide selection of fish and seafood, tapas, and other traditional dishes – all with the chef’s modern spin. The restaurant uses high-quality ingredients imported straight from Spain in its commitment to authenticity. With its luxurious decor, expansive menu, and delicious wines Ibérica elegantly combines the old with the new. All in all, this is the perfect place to go for a little indulgence and celebration. Brasserie Harricana is one of the latest additions to Montreal’s craft beer scene. Located in Villeray, a neighbourhood not too far from the Mile-End, this spot is great for beer and food enthusiasts, alike. In a chic tavern setting with white tile floors and pastel-pink chairs, Harricana offers a refined selection of crafts beer and ciders, imported bottles of beer, rum and whiskey. Above all, its a microbrewery: Harricana brews anywhere from 10-20 unique beers on site. Moreover, it serves-up some delicious hearty meals to pair your drink with. A variety of meats, burgers, and delicious snacks will surely tickle your tastebuds. Japanese pub Ichigo Ichie is on our list because of the owner’s first and locally adored restaurant, Imadake. This similarly amazing second venture is set in the Plateau on Rachel street, not far from LaFontaine Park. Ichigo Ichie will be your go-to post-park spot for a unique Japanese pub experience. Most importantly, it’s the place to get delicious ramen and more in the heart of the city’s colourful Plateau neighbourhood.